Jet Skis are a fun way to spend time on the water with your family and friends during the summer. Compared to a boat, Jet Ski’s can be quickly launched from storage without unwrapping or lengthy safety checks, and can easily be hauled. However, they still need to be taken care so you can enjoy long days aboard your Jet Ski for years to come. When it comes to Jet Ski maintenance, taking preventative steps can keep you having fun and avoid being stranded out on the lake, ocean or gulf. Here are some maintenance tips to get your started. Whatever make or model PWC you have, always reference the Owner’s Manual for specific things you will need and exact procedures to follow. Our checklist and tips are just a guideline. Some of the older model Jet Skis have 2-stroke engines, which means that they require premixed oil and fuel. Newer Jet Skis have 4-stroke engines that don’t require a mixed solution; rather they have separate fuel and oil areas. When you take the Jet Ski out of storage, be sure to properly evaluate your fuel. If you stored the PWC with fuel in the engine and no fuel stabilizer, make sure that you add a fuel cleaner and stabilizer before you start it. If old fuel is remaining in the engine, you will want to dispose of it. Consult an expert if you’re not sure and ask them to drain and dispose of the old fuel. Never dispose of old fuel in the trash or any body of water including storm drains, streams, and sewers. This can cause fires, explosions and ground contamination. Before you start your PWC and go out on the water, you will want to look over all of the wires, including throttle cables and trim. Look for any loose or damaged parts, and always replace them if you notice any damage or extensive wear. It’s important not to start your Jet Ski’s engine if you can smell fuel; this could be a sign of a leak, loose cable, or damaged fuel tank. Every time you go out on the water the Jet Ski will be exposed to aquatic elements. Be sure to wipe down the windshield and seat to prevent corrosion or staining. Keep in mind that saltwater is corrosive to metal and proper cleaning of the body of your Jet Ski is essential to extending the life of your investment. Personal watercrafts aren't intended to be stored in water for long periods of time. Floating PWC lifts prevent hull delamination and PWC intake fouling. When you’re cleaning your Jet Ski, it’s easier and safer to walk around the watercraft when using a PWC lift. They also make boarding and exiting the watercraft easier and safer for riders of all ages. Not all PWC maintenance is done multiple times throughout the year. At least once a year make sure to change the engine oil and filter, drain the pump oil and replace it with new oil, add grease to all seals and bearing fittings, and lubricate the parts. When the summer is over and it’s time to winterize your personal water craft, make sure that you drain any water from the engine, clean the craft thoroughly, lubricate metal hinges and handles, fill with fuel and add fuel stabilizer, cover it up and store! Keeping your jet ski up and running properly is essential to extending the life of your pwc. JetDock’s PWC and Jet Ski lifts are maintenance free, leaving you more time to focus on your jet ski, boat, and other watercrafts. 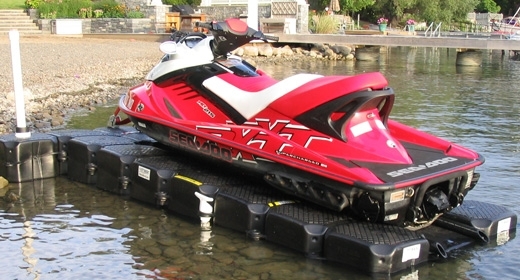 JetDock offers single floating PWC lifts, double Jet Ski lifts and combination Jet Ski lifts are available.